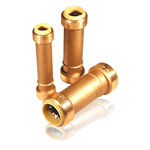 Home :: Push Connect Fittings :: Couplings :: Slip Couplings :: Push Connect™ Slip Coupling 3/4"
ProBite® provides lead-free long lasting slip couplings that are easy to install, remove and reuse. Connect to copper, PEX and CPVC in any combination. The perfect solutions for pipe fitting repairs. Only one end of the coupling has a stop, allowing the other end to slide freely over the end of a pipe.